Changing its name many times, shown below is the history of the iconic and sadly missed 'Carlton Hotel'. Boots the Chemist was originally in No. 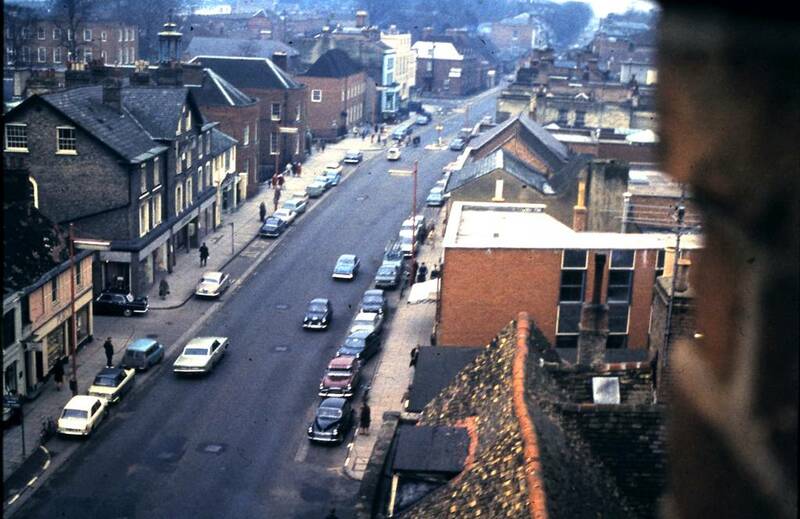 128 High Street and moved to No.82 High Street in 1978 as an extension of the Rookery Shopping Centre scheme. Photos by kind permission of the Newmarket Journal and the Newmarket Memories Facebook page. 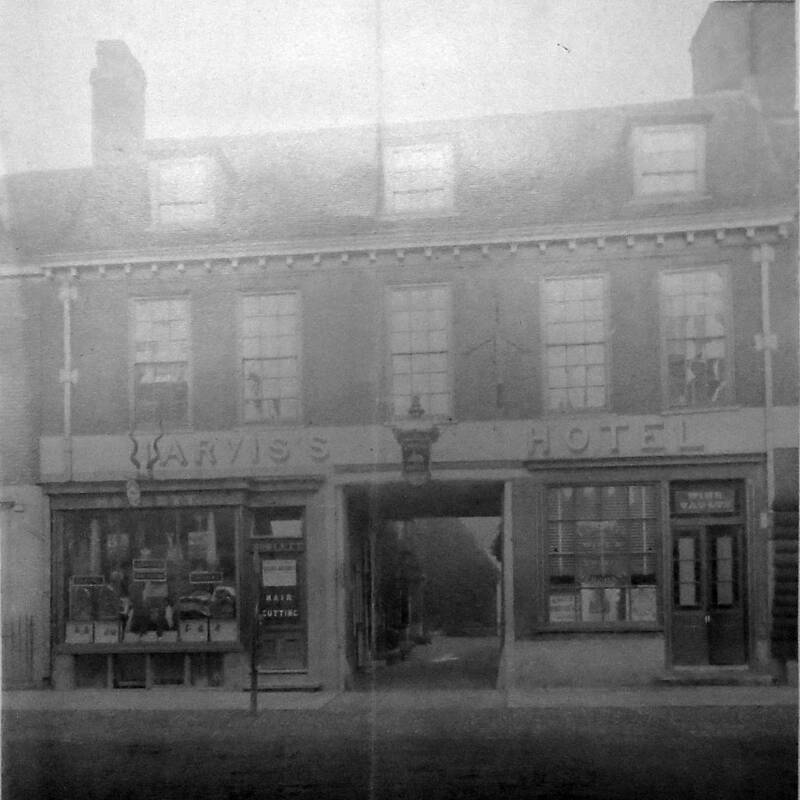 KING EDWARD VII dined there, Fred Astaire danced there and countless US servicemen had far too much to drink there - the Carlton Hotel was a feature of Newmarket High Street for more than 100 years. By the time it was demolished in 1977, much of the old grandeur was long gone, but in its heyday the Carlton had been as exclusive as London's Dorchester, built to appeal to wealthy racehorse owners and top jockeys. It is thought to have been built in the 1860s and started life as The Greyhound Hotel. It was partially built around a steel frame with concrete infilling and was reputed to have been one of the earliest examples of that type of construction. Its ornate Victorian front, with a balcony at first floor level rising four floors to a domed mansard roof, is the way most Newmarket people who knew the Carlton will remember it. As the Greyhound it saw many grand occasions, including balls to celebrate the Derby wins of the country's most celebrated jockeys Fred Archer, who lived in Newmarket until his suicide in 1886. In 1897, the Greyhound became the Victoria Hotel, probably to coincide with the Queen's Diamond Jubilee . A directory published in 1900 described some of its features, which included Turkish baths, winter gardens and bijou theatre. The hotel had 70 bedrooms, 12 large self contained apartments, two large bars, a ballroom and a restaurant. Its staircase was of Purbeck marble. The total floor area of the building was 45,000 square feet - no wonder people claimed at the time you could quite easily get lost in its maze of corridors. Its ballroom was a big attraction and by far the most famous feet to trip round its polished floor belonged to Hollywood legend Fred Astaire. At the time the hotel was demolished, Cecil Coates, who had been its general manager between 1933 and 1946 remembered the visits of the dancing genius. "Fred was a member of the Craven Club which had its headquarters in the hotel. He was on stage in London at the time - around 1924 and he came to Newmarket frequently as he had horses in training with the late Jack Leach. "I know for a fact that Fred danced on the Craven Club mantelpiece for a £5 bet," he said. The arrival of American troops in East Anglia during the Second World War brought wild times to the Victoria, with military police virtually a permanent fixture outside as the GIs got drunk and fought with themselves and some of the locals. And such were the fears that an invasion was imminent that members of a Scottish regiment were seen dancing in the ballroom with their rifles on their backs ready to repel any invaders. 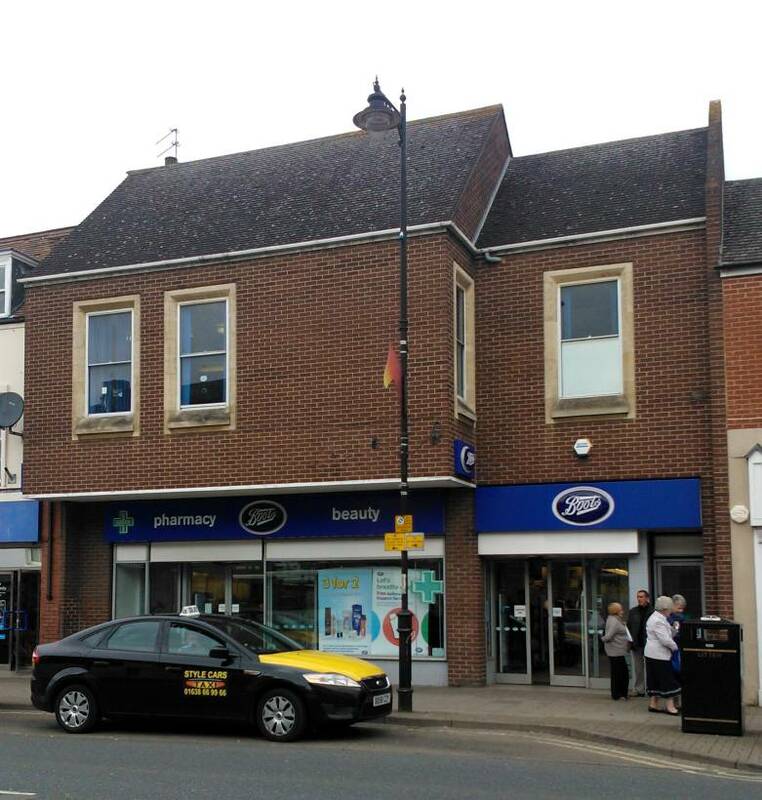 When Newmarket High Street was targeted by a German bomber in February 1941, the Victoria, the most prominent building in sight, freakishly escaped any damage. 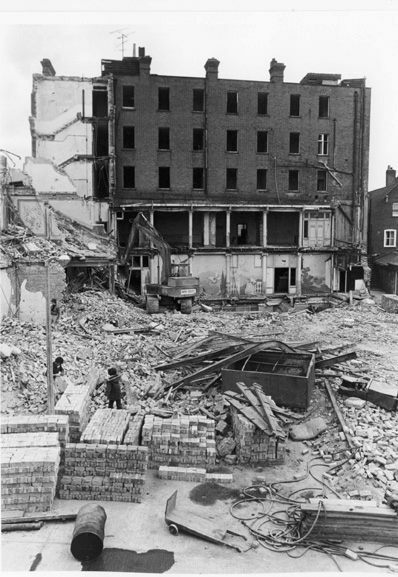 A story circulated in the town that a German spy had transmitted messages to headquarters from the fish shop in nearby Market Street and that the hotel with its Forces lodgers and the Memorial Hall, where top military brass had been meeting on the day of the attack, should have been bomber’s targets but other buildings in the High Street were hit instead including the post office which then stood between the two. The Victoria Hotel eventually became the Carlton which continued to be a centre of town entertainment through the 1950s. Newmarket Jazz Club met there regularly and some of the biggest names of the genre played there including Chris Barber, Acker Bilk, Kenny Lynch and Humphrey Lyttleton. By the early 1960s financial problems were starting to mount and by 1965 the official receiver had been called in to try and sell the hotel. 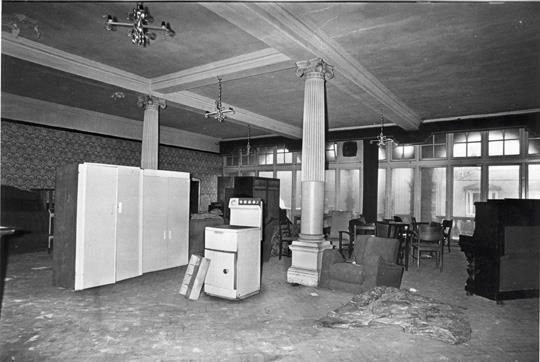 In 1973 it was confirmed that film magnate and millionaire Irving Allen had bought the Carlton for a reputed 100,000 and there seemed a chance that it might be restored to its former glory. Tenants of the flats in the hotel were told to leave because the building was in such a bad state of repair but a year later nothing had happened and the site was again on the market. Mr Allen’s plans to try and bring back the glory days appeared to have floundered because they were uneconomic. It was eventually sold to a Peterborough based property company for around 60,000 in 1977. 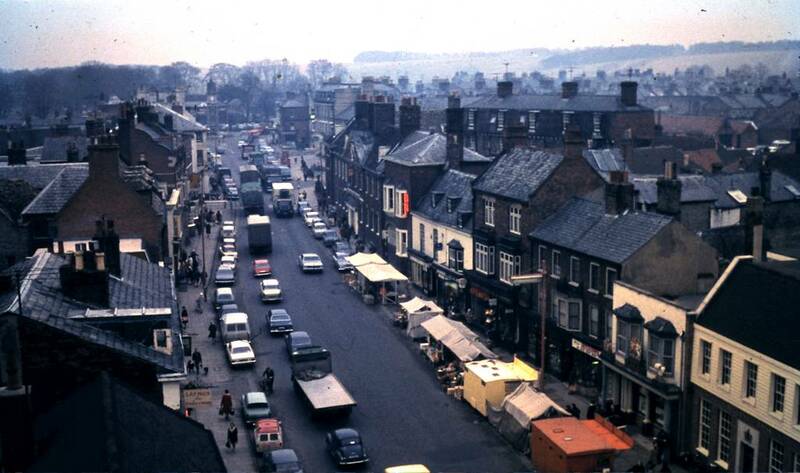 Permission to demolish the hotel and replace it with shops had already been granted by Forest Heath Council and the task of flattening Newmarket High Street’s most iconic building was completed by early May 1977. In its place came chemists Boots with the remainder of the site sold off for the development of the Rookery. Such was the end of the Carlton, a building that had dominated Newmarket High Street for as long as many could remember. 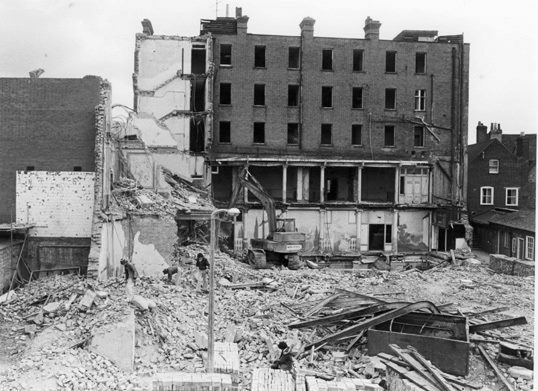 One regular remembered: "The Carlton was more than a building; it was a kind of crossroads of ideas, lifestyles and happenings where people met and felt enriched by being or having been there." 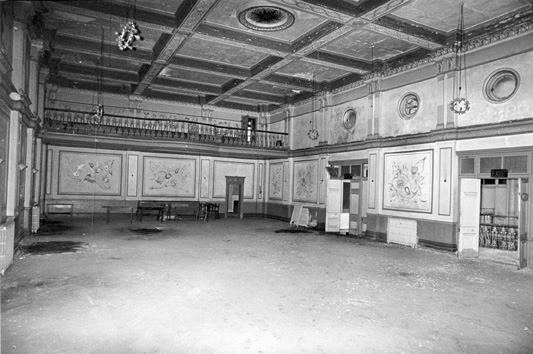 The Victoria Cinema was located in the hotel ballroom. 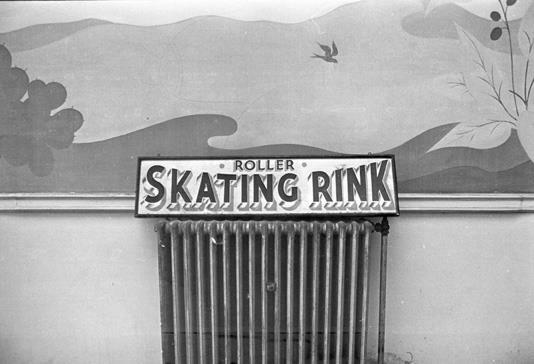 It was in use as a ballroom in 1924 when Fred Astaire appeared here. The Victoria Cinema played pictures and ocassional variety shows on its 15 feet deep stage. There were two dressing rooms. Victoria Mansions 4 - Fenn, Harold W.
Victoria Mansions 6 - Coates, Cecil H.A. Cecil Coates was the licensee all through World War II. The Craven Club moved to Primrose House No.38-40 High Street sometime after this directory listing. Barrington Lynham was a jockey, he married in 1905 in Newhaven, Sussex and moved to Newmarket in about 1909. One day in Essex Street I had a caller who asked me whether I would be willing to interest myself, on certain terms, in the Victoria Hotel, about which there was a suggestion of turning into a club. The "certain terms" were stated, for I never believe in tackling a business proposition unless there is a certain amount of ready money in evidence. I should like to explain fully to those who became members, and to many who have discussed the question of the club and the money which was spent on altering the building, so that they should have the exact story. It appears that a year or two before the matter was brought to me that Cecil Drew, a well-known member of the Stock Exchange, now dead, who was largely interested in mining stock, had been down to Newmarket for a coursing meeting, and having won a little bit was on good terms with himself that evening when the proposition was put to him whether he wouldn't like to buy the Victoria Hotel. I believe the price mentioned was twenty thousand pounds. The place had originally cost - land and building - eighty-five thousand pounds, and a certain amount more, about twenty thousand pounds, was spent with Maple's, so that altogether this was a very expensive white elephant. It was built on the site of an old inn called the Greyhound, where William Jarvis, the trainer, was born. However, I will not go into the history of this, but tell the tale so far as it concerns me.
] cleaned from top to bottom, painted and repapered; and another essential was to get the electric light supply from the town. At one or two meetings of directors all my proposals were agreed to. An application was made to the Licensing Bench to keep the bar licence, as distinct altogether from the club, as there was a nice little bit of profit out of this bar, and, as I pointed out, if the club did not succeed then it might have to be sold and remade into an hotel. However, that came off all right. The repairs were begun, and a certain amount of new furniture purchased to furbish up some of the best rooms, and especially to make the winter garden attractive. It all went on steadily. At the Craven Meeting it had not been converted into the club, but then came the change. Everything was progressing, and the place beginning to look beautiful, when the death of King Edward came; it was then good-bye to the Second Spring Meeting and a terrible set-back. I must explain that, over a year before I heard anything about the place. Lord Charles Ker had been round to many well-known men, and had got their sanction to go on a sort of honorary committee, and these names were handed to me with pride, as signifying that those were the people I had to put at the top of the bill to show the public what sort of club we were going to have. But there was soon to be disillusionment about these names. Lord Lonsdale came to me on the course and said that he must ask for his name to be removed. He did not deny, of course, that he had told Lord Charles that he would "do all he could," but that had been such a long time before. At all events, he had thought better of it, and did not wish to associate himself with the club at all. At the same time he said he very much doubted whether there was any room for such a place. The jockeys and trainers and others had the Subscription Rooms, and there was accommodation in the Jockey Club, etc., for others. I pointed out to Lord Lonsdale that we had enough trouble already with the death of the King, and that if he and others insisted on their names coming off it would do us serious injury. What his private reasons were need not be gone into. However, he gave his sanction to let his name remain for another month. There were some very elegant enamelled club badges - life members and ordinary. Then came the difficulty as to what social lines the club was to be run on. Several of the jockeys had put the question to me, as it was natural they should want to know how they stood with regard to the Turkish baths, a necessity for them. I gave my views that, with regard to men high in the social scale, they all were " waiting " to see what each other did ; one or two told me frankly that they would look on for a year or two, and see what was going to be done with the place. From the very start I had my own idea that the only way to attract membership was to make it thoroughly cosmopolitan. For instance, there were several well-known layers of odds, such as Ted Hopkins, who always had a suite of rooms reserved for him, so it was agreed that all reputable persons should be eligible; and then the ten guineas began to roll in and there were several foreign members at five guineas - men who came over from France occasionally to Newmarket. The best part of the jockeys joined, and I must say that they were the most grateful for what was supplied to them. I engaged a ladies' orchestra of three, but, by heavens! how I wish I hadn't, for at odd times between meetings when no member save myself, and perhaps one other, was in the club the place became as dead as a morgue. Still that piano, violin and 'cello would drone away at waltzes and selections, while I sat in a small office on the balcony overlooking the winter gardens, hearing the drip, drip, drip of the melancholy fountain, heard the last twitter of the wheezy consumptive in the aviary due to die that night, and saw a thrifty club steward come out and turn off the lights in the winter garden. There was one waiter, an excellent chap, whom I had kept on; he very much resembled, in fact was the dead spit of Alfred Lester. So, dear friends, can you picture some of the moments in that damn club? A little life was put into it on one or two occasions by having a dance, but this was misunderstood by Newmarket, who didn't want any innovation, and who were too mean to help the show along. I had the ******s down - that trio so well known in the West End of London - for the July meetings; a few would come and hear them. In the meantime, not having a garden, it was decided to take Willoughby House, a beautiful place with a lovely old garden. Tennis and badminton were in- stalled, and became real popular. I will say for certain members of the Ring that they applauded to the echo everything done to amuse them. The big drawing-room, furnished I think very elegantly, was used a fair amount, especially on wet days. But then came periods when a lonely caretaker in livery would stand at the open door trying to welcome in members who never came. "What time will I shut the club tonight, sir?" he would ask. "Any time you darned please," I would reply, and go over to the club proper to hear the cursed drip-drip of that everlasting leaking fountain. In the late summer I had to think of what was going to be done in view of the autumn. Drew was a sick man, but I had to tell him that the bills were coming in. Another hundred was wanted for the electric light company, in addition to what had been paid them. Then the butcher wanted fifty pounds, and various other suppliers cheques, especially the builder who had done all the decorations; everyone seemed to be wanting a bit. I had arranged an over-draft a little while before of five hundred pounds at a local bank by Drew's wish. I went to his club in the City and begged him for a few hundred pounds to keep the show going. He was obdurate, telling me that he couldn't spare it, and why didn't I try and sell it. I did try, and very hard. There was an idea in the back of my mind that a Stores would go well at Newmarket, and I spoke to Mr W. B. Purefroy about the scheme. The idea was that it might interest Mr Hippesley Cox, who was and had been in the manager-directorship of Romano's and the Inns of Court Hotel; but nothing came of that, although I had heard that Mr Cox had been possessed all his life of the ambition to control big stores. There is still a chance at Newmarket for some firm to follow up this idea. Boots' have a place there, also Salmon & Gluckstein, but there is a lot of money in the district to be disbursed. Still, Newmarket shops supply pretty well all which is required, and the food especially is excellent. I tried to get a certain number of debentures placed, and all this was told to Drew, who a month or so before he died sent me a very charming letter thanking me for all that I had done. I am quite sure that, had another thousand pounds been forthcoming, we could have gone on for the October meetings, and those down for the December sales would have kept the game alive. But it was hopeless without any money, and I wrote and resigned my manager-directorship, while holding a certain number of ordinary shares. The matter was left in other hands, and I was so full up with the whole show that I took a continental trip, not feeling too fit after all the worry. Then came the time when the club was closed down, and the melancholy thing was that the place was shut up just as everyone wanted it. When abroad, I heard of the death of poor Cecil Drew, who died very tragically. It was a terrible shock, for I had been on very intimate terms with him. We only fell out once, and after that little difference was adjusted we were just as good friends as before. Drew loved an open-air life, but would sit up late with the best of them, yet nevertheless was up very early and out on the Heath whenever he visited Newmarket. He had a nice house in the country and loved everything in the way of nature. A genial companion, he made very few enemies, but was simply tired of pouring money away on his Newmarket investments long before I had anything to do with the show. I had furnished a special suite for him at Willoughby House, which, however, he had never taken possession of. There seemed a sort of fatality about that place, but the expense concerning it was not very great. I am afraid that in connection with the Counties Club there were not very many incidents connected with turf history. When not at Newmarket I live at the Waldorf Hotel, and Cecil Drew, a very early bird, would come up to my room and have a chat about things in general. Mr first steward - with his wife - was engaged from the staff of his hotel, and I had as much sympathy on occasions for him as for myself in those terrible moments when we had to wander round the big building with an absolute lack of patronage. The day after the King died I went down to Newmarket; it was the Saturday when the Jubilee had been postponed. The terrible tragedy of King Edward's death seemed to be more marked at Newmarket than anywhere, and it will be remembered that all the racing was abandoned for a period. To those who have heard the topic of the Counties Club mentioned, I would repeat that the club was not my idea: I was brought into the scheme as no one else seemed capable of carrying it out in any way. The club certainly became a success of esteem, but there were so many factors against it: the death of the King, lack of capital and want of good-fellowship on the part of many local people to support what was really resented. Poor Drew always regretted his bargain, and the bad spec, was always on his mind. He left over fifty thousand pounds, so it wasn't a question of not being able to find any more capital - he wouldn't. Barrington Lynham is now making a big living out of it: he paid under four thousand pounds for a place originally costing six figures of pounds! To be Sold for the Purpose of Winding Up a Company. 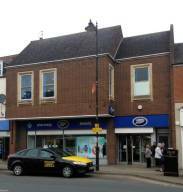 Upset price for the Freehold, with possession, £15,000. The buildings are modern construction, well planned and fitted, furnished, and equipped in a handsome and up-to-date manner. There is also an hotel tap entered from Drapery-row. The purchaser has the option of buying the furniture and equipment valuation. The stock-in-trade is be purchased. Arrangements could be made for portion of the purchase money to remain on mortgage. Particulars may be obtained from Messrs. PONTIFEX, HEWITT & PITT, solicitors, 16. St. Andrew's-street, Holborn ; and WEATHERALL A GREEN, surveyors and auctioneers, 22, Chancery-lane, W.C.
By the 1911 census Frank Phillips had moved on to become the proprietor of the Bell Hotel, Derby. It's reported elsewhere that it's thought that the 'Carlton' building was built in the 1860's, but if you refer to the 1886 map of Newmarket (shown on the homepage of this web site), although there's a large building at this location it's plan is much more fragmented. The map shows a courtyard running through the centre of the site and this is confirmed in the 1880 photo shown below. The later, much grander building is clearly shown on a 1902 Newmarket map and is then listed, as expected, as the Hotel Victoria. This would suggest that the 'Carlton' building was built sometime between 1886 and 1902. The building was constructed around a steel frame with brickwork and concrete infilling, reputed to have been one of the earliest examples of that type of construction. Historically the first UK building to make extensive use of steel was probably the 'National Liberal Club' in London, built in 1879 - so this somewhat confirms the construction of the 'Carlton' building as being later than this. 23 Oct 1896, for Reilly & Co - hence it was clearly built and named to coincide with the Diamond Jubilee of Queen Victoria (1897). The Greyhound Hotel was frequently used as a boxing venue ... up until at least the end of 1895. In the 1861 census William Arthur was living with his father (another William), who was Inkeeper of the Railway Inn in Railway Street (later to become the Carpenters' Arms, 82 All Saints Road). Williams Arthur's grandfather (another William ... getting confusing this) was Inkeeper of the Greyhound in 1861 and a farmer (of 3 men) ... by 1871 both Willam Arthur and his father had moved to the Greyhound, with 18-year-old William Arthur now listed as a 'trainer of horses'. In the 1879 Kelly's Directory his father was still in the Greyhound and William junior was now the trainer in Waterwitch House Stables, Exeter Road. His father died in 1880 and his widowed mother Louisa is shown as the Innkeeper at the Greyhound in the 1881 census. In the 1841 census many of the Jarvis family were originally Coopers in Market Lane. There was change all round in that same year, Sir Christopher Wren, on visiting Newmarket, described the old palace there as a ‘vacant yard’. But it was a while before anything constructive was done, possibly because Wren and other top architects were devoting their time and energy to building projects in London in the wake of the great fire of 1666. The following year, Charles bought an old house off Lord Thomond that overlooked Newmarket High Street for £2,000 (£231,236 today), and he also bought the Greyhound Inn next door for £170.10s (£19,713 today) from a family named Piches. He then employed William Samuel, ‘a gentleman architect’, to construct a residence in which he could live and entertain. For now, his base continued to be Audley End, and in 1669 - despite the fact that construction work had begun in Newmarket - he offered to buy the house for £50,000, although the cost was never paid in full. As detailed above King Charles II bought the original Greyhound Inn in 1667 - the purpose of his purchases in Newmarket was to construct his new palace in the space these buildings occupied, hence the location of this Inn was on the other side of the High Street at that time - annotated plans of the palace by Thomas Fort, Clerk of Works (1719-1745), show that this was between present day No.s 53 to 61 (HSBC Bank, Yorkshire Building Society and Premier Travel Agents). Shop on ground floor with storage and admin. rooms on 1st floor, access from service yard. [Note from webmaster - my claim-to-fame regarding the Carlton is that my Nan used to clean there 'when it was still posh' - she recounted to me how she used to clean the copious brass features in the opulent staircases with a toothbrush - 'to make them sparkle'. Sometime in the late 1940s, convinced by a friend, my dad had ballroom dancing lessons in the Carlton, arranged by the Simpson School of Dancing. Later, after marrying my mother, he had the opportunity to take advantage of these lessons when he attended a dinner dance there for Crisswell's Garage. The above picture clearly shows the Carlton and it's position in the High Street ... the shear scale of the building dwarfs the surrounding properties. The Winter gardens can be seen towards the rear in the middle, as can the impressive frontage onto the High Street. Many thanks to Tony Pringle for his information about the history of the hotel & pub and the photo 'Hotel Victoria'. and 'The Greyhound Courtyard c. 1880 (The Carlton)'. 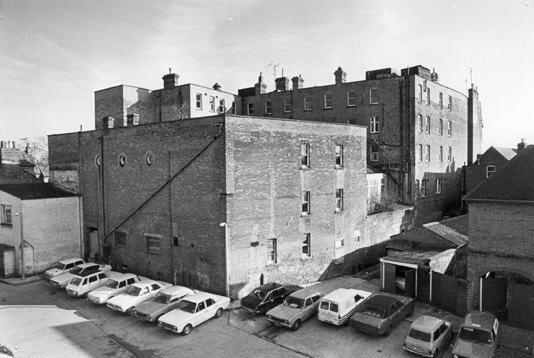 Photos 'Carlton Hotel 1977' by kind permission of the Newmarket Journal and the Newmarket Memories Facebook page.